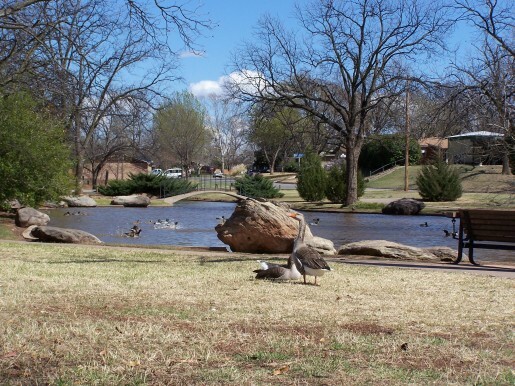 Lucy Park is a 178 acre regional park located in the center of the city. The park is in a bend of the Wichita River which gives it a natural setting with huge pecans, cottonwoods, and numerous other species of native and introduced trees. A large pond area is dedicated to waterfowl, and ducks and geese can be found there year round. For hiking and biking enthusiasts, there is a 1.7 mile concrete trail that circles the park. This is the west starting point for the City-wide Circle Trail System. There are 2 large picnic shelters that can be reserved at a cost of $15 for 4 hours. The main shelter has 20 picnic tables and will seat approximately 120 people. The Lucyland shelter has 15 tables and will seat approximately 90 people. The park has a Log Cabin that can be reserved for parties and will accommodate 55 people. The park has 2 public restrooms, a large swimming pool, basketball goals, 18 hole disc golf course, 3 modular playgrounds, 2 sand volleyball courts and 1 concrete volleyball court. There are 5 smaller picnic shelters, 30 individual picnic tables, 34 barbeque grills, 4 drinking fountains, and 86 benches. 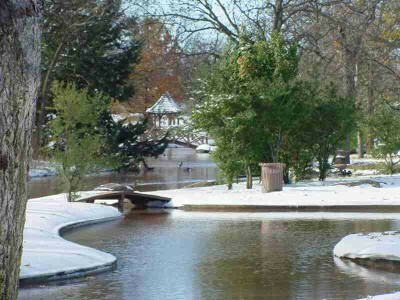 The River Bend Nature Center utilizes 15 acres of the park along 3rd St.
Other Lucy Park attractions include a swinging bridge across the Big Wichita River, and a scenic walk along the trail that leads to the Falls.